Family, friends, fellow travelers, curious readers and people redirected to this blog without any specific reason: Welcome! We are very happy to see you have found your way to our blog again! To start: We have left Mexico! Who could have imagined that we would have almost exceeded our allowed stay of three months in Mexico without even realizing it? We sure couldn't have imagined this. To start we were imagining to go through pretty fast, having spend 7 weeks in the USA, 6 weeks should have been sufficient for Mexico. Well we were wrong, the truth is that Mexico is a great country to visit, there is such a variety of things to see, the country seriously has everything from good food, to friendly people, nice mountains and beaches. And can you imagine that there are still many popular destinations which we have skipped (like Baja California, James Ensor's house and not to forget Queretaro. Oh how many people have asked us if we have been in Queretaro, and every time we had to tell them we haven't, but that we have been in hundreds of other places). So to be clear: if you think that Mexico is dangerous, it is not and if you think there is nothing to see: you are wrong. We don't want to start a travel agency here, but can only encourage people to visit this country. So after this long introduction let's get to business. Last time we left you in San Cristobal de las Casas ( for your convenience we have again added a small map of our latest adventure). Before leaving there we suddenly met many other long term travelers on the local camping, two french couples travelling in a regular camper and in a large school bus, and one English family travelling in fully equipped MAN truck, very cool thing to see. After having spend a great time in Oaxaca, we explore the province of Chiapas in detail. Located next to the boarder of Guatemala (in the past it actually even belonged to it) the place is a nature paradise with many jungles, waterfalls and animals. After visiting the breathtaking waterfalls of Chiflon we go to the Lagos of Montebello - a series of 50 lakes located nearby each other known for the different colors of the water (of which we could not appreciate any of them- maybe because of the bad weather...). 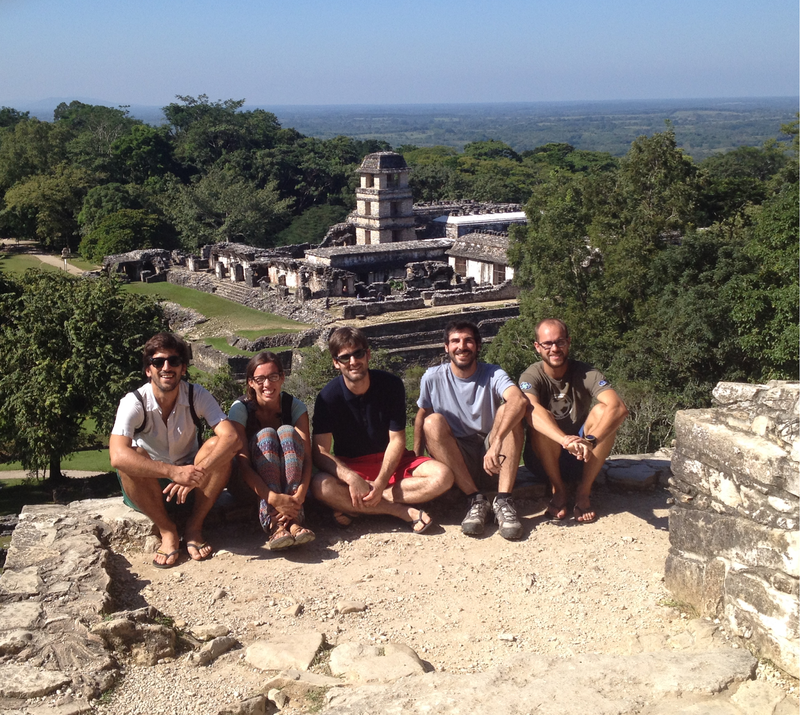 Here we met three super nice Basque with who we went to explore Chiapas together. From the lakes we go to the next village, Las Nubes, where we enjoyed a nice waterfalls. We can imagine that you are already very bored with all the waterfalls. be patient, as there are many pictures of waterfalls following. Las Nubes was amazing: the relatively calm river is squeezed through narrow parts resulting in non stop violent rapids at which we could look hours. Having no food here the locals were prepared to kill (our request was unusual and difficult: chicken with no head, no lungs, no heart, no legs...they just laugh) a chicken for us, which we could put on the barbecue after our order, yammie yammie! From here we continue our trip passing the jungle of las Guacamayas where the howler monkeys make you believe that they are gorillas and you can see guacamayas (season is around June) . After a guided tour through the jungle we go to Yaxchilan, a Maya site located in the dense jungle and only accessible via boat - this was truly a spectacular location. The famous Maya riviera went from bad to good for us. We start in horrible Cancun, to go down towards Puerto Morelos where we could snorkel through the second largest barrier reef in the world. After we pass in Akumal where there is a beach with over 30 resident turtles with who you can swim (apparently they are staying there naturally). After swimming in the water for 20 minutes we were almost going to give up and go back to the beach, until we suddenly saw two enormous turtles swimming. The water is not deep at all so we could hoover above them while they were eating there the seagrass. From there we could go to the famous beach ruins of Tulum, build high on the cliffs looking at the beautiful Caribbean sea and where we stayed for 2 days. 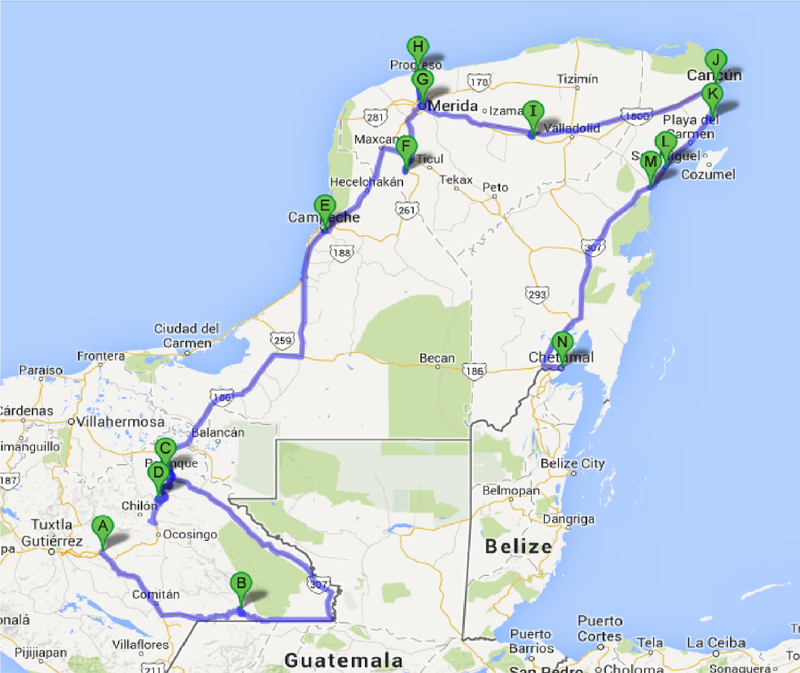 From there we have left Mexico and entered Belize, on which we will say more in a next post. We have been truly blessed in life to have already lived what we have lived so far and are looking forward to the rest. With the end of the year approaching, we would also like to take the opportunity to wish all of you a great holiday season! We'll be thinking about all of you! After, we go to Las Guacamayas, located in the jungle of Chiapas nearby Guatemala, which is named for it's presence of the Guacamaya ( named Ara in Dutch). These birds are much larger than expected. More ruins wait for us the next day in Palenque, also located into a dense forest/jungle but very well maintained: good views and good company! At a pretty boring and expensive ruin we could take a swim in a cenote, which apparently only exists in the Yucatan area. The believe that the holes might have been created by meteorites. The water comes from underground rivers, making the water super clean. Chizhen Itza is one of the new world's seven wonders, partially due this building named the caracol. It served as a observatory of the sky and 20 sight lines indicting astronomical events have been found here. Hi Annelies! Yeah it was veryvery beautiful - pictures will follow soon! Have a great end of the year and a merry christmas! Gabi! Jo ambé us trobo abfaltar! Disfruteu del nadal en familia, ja que jo no puc! Wow chicos! Looks amazing! Now I really want to go to Mexico! Swimming with the turtles, awesome! Keep having fun and Merry Christmas!! Do you still have the job offer there, you can reconsider?! Anyhow, we hope you ahd a great time and that you are enjoying the end of the year with the family and friends! Marc! Gracie :) ho estem disfrutan molt, xo sempre trobant a faltar a la familia! Espero que tingueu un Bon Nadal. Y no tardeu en tornar a publicar. Hola nacho! Bon nadal a tu tmb! No et preocupis, publicarem aviat! We put 12 of them on our roof, who knows they survive to the end! Feliz Navidad! Me alegro que esteis disfrutando tanto! Un beso a los dos!!!! Bon nadal!! Ens encantaria estar amb Vosaltres en aquest dis tan importants! Igualmente pulguis!! Felicidd ipy amo alla dinde esteis! Os echamos de menos!! Increíble chicos!!!!!! Feliz Navidad!!!! !Un beso fuerte! Lucia feliz navidad y año nuevo a ti también! !